Singularity Lab is very happy to announce that their sci-fi arcade racing/shooter game JetX is now available for PC via Steam. The post The sci-fi arcade racing/shooter JetX is now available via Steam appeared first on N4G. From Ubisoft: "We will be performing an emergency server maintenance in 30 minutes, at 13:30 CEST / 7:30 EDT / 4:30 PDT for The Division 2. We're fixing an issue that could cause the Demolitionists tactical link buff to stack infinitely. " The post Ubisoft fixes The Division 2 Demolitionist's Tactical Link Buff appeared first on N4G. Clearly, Borderlands 3 has people hyped. How hyped? Enough for Borderlands 2, a game released way back in 2012 (yes, seven years ago! ), to climb back into Steam’s top five most played games list! 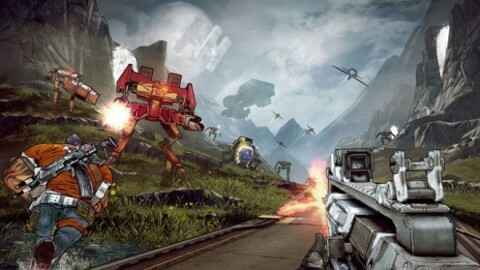 It seems Gearbox Software and 2K Games’ decision to have Borderlands 3 available initially at the Epic Games Store hasn’t dampened people’s excitement for the franchise. Checking SteamCharts, you can see Borderlands 2 peaking at 59,333 players last weekend, which is close to half of Borderlands 2’s all-time Steam peak of 124,000 concurrent players way back in September 2012. No doubt this spike can be attributed to the re-release of the game via The Handsome Collection. That said, this is very impressive indeed — especially if you factor in that this doesn’t even include console numbers. Borderlands 3 is set to launch this September 13 on the PS4, Xbox One, and PC, and you can check out the announcement trailer here which includes gameplay. Gearbox has announced that we’ll see our first hands-on impressions of the game come May 1, but in the meantime, you can also check out a leaked trailer right here. The post 7-Year Old Game Borderlands 2 Climbs to Top 5 of Steam’s Most Played List With Almost 60K Concurrent Players appeared first on MP1st. Ubisoft and their latest title were under the spotlight recently. They apologized for homophobic slur found in The Division 2. The post Ubisoft apologized for homophobic slur found in The Division 2 appeared first on N4G. Last Epoch is an online action RPG that combines time travel, deep character customization, crafting, and an engrossing loot system that guarantees endless replayability. The post Last Epoch Comes to Steam Early Access Later This Month appeared first on N4G. Skewed and Reviewed have posted a look at the Stronghold raid on the Hyena from the Division 2. Working with a four person crew; they cleared up the bad guys. The post Hyena Stronghold Mission Video: The Division 2 appeared first on N4G. Siege of Centauri is a new take on the tower defense genre and is set in the Ashes of the Singularity universe. The post Siege of Centauri Comes To Steam Early Access Next Week appeared first on N4G. Developer Vile Monarch and first-time inhalers Devolver Digital announced that "Weedcraft Inc", the first original IP to come from Devolver Digital in its 10-year history, is now available on Steam and GOG. The post Weedcraft Inc is out now for PC via GOG and Steam appeared first on N4G. The Chinese indie studio Spark Games announces today that its first game, Metaverse Keeper, is available today on Steam. The post The roguelike dungeon crawler Metaverse Keeper is coming to Steam today appeared first on N4G. From VG247: "The Division 2s very own Public Test Server (PTS) will be available ahead of the games third major update. During this weeks State of the Game livestream, The Division 2 developer Massive confirmed that the PTS will return in The Division 2. The games next big update, simply called Title Update 3, will be the subject of the first test." The post The Division 2 is getting a test server appeared first on N4G. What does TKC stand for? What games does TKC play and support? What is TKC's philosophy towards maintaining and supervising their servers? What are your server rules? Ok I'm a member now, what is expected of me? I'm a good member of TKC and I follow all the rules, can I be a server admin? I just got a game server, can I make it a TKC server? Who are the leaders of TKC? TKC stands for "The Killing Committee". TKC was founded by (TKC)Big Flem and (TKC)Squidward. You can easily find any of our servers by using the "Server Status" tab. You can also find our servers at the bottom of our forums at: http://www.clan-tkc.com/phpBB or at GameTracker: http://www.gametracker.com/clan/thekillingcommitteeclan/. If you need any help finding our servers in-game, just come to our forums, post a topic and we'll try to help you out. TKC servers are well run and every attempt is made to ensure a fun gaming environment. No racist or rude behavior is tolerated on any of our servers. TKC tries to have round the clock administration for it's servers but obviously sometimes a server will have no admin playing so if you witness any abuse for any game please attempt to report the offending players nickname, and if possible GUID here: "Server Vistors Complaint". Just give as many details as you can remember such as what the player was doing/saying. In addition cheating is not tolerated on our servers. We are protected by any of a number of different cheat tools at any given time including; VAC, steambans.com, pbbans.com, ggc-stream.com, metabans, pbscreens.com and punkbuster, depending on the game. If caught cheating your information will be submitted to the appropriate cheat tracker and you will be added to their database which will ban your Steam ID, PB GUID or EA GUID depending on the game and website. When available we also offer ways for players, in-game, to contact admins to report bad behavior. These come in the form of game server plugins. Players will, if the server has the option available, have the option to report a player using, @report [player] [reason] or @admin [reason] to call an admin to the server. If an admin doesn't respond in a timely manner, please use the @report option so we can follow up on it later or use "Server Vistors Complaint" as mentioned above. If an admin is not available, we also try to give the players the opportunity to use @votekick [player] or @voteban [player] [reason]. This allows the guests to our server the ability to kick or temporarily ban a player who is breaking rules. Profanity - Many of the games we play have very bad language, some don't, that should make a difference in how we enforce our rules. For that reason we are going to implement a new rule, which will seem strange at first, but there is reason behind it. Bad language will only be tolerated on Teamspeak channels for games where there is bad language in the game. In other words, since there is bad language in Bad Company 2, bad language will be acceptable in the Bad Company 2 Teamspeak channel and on the Bad Company 2 servers. On our Half-Life 2 DM Teamspeak channel and game server, bad language will not be allowed. Future games will also be handled in this manner. The reason, we do not want to exclude members with different beliefs. If I buy a game and one of the selling points for me was the fact that it did not have bad language, that should be respected. I do not want a father or grandfather having to explain bad language to their children or grandchildren because they heard profanity on a TKC Teamspeak channel they thought was free of such things. How to deal with with Mic/Text spammers - No one wants to listen to a lot of unrelated chatter either on the game server, or Teamspeak. No one wants to see a lot of text spamming either. It's distracting to some, and in the case of Bad Company 2, causes lag problems when the text log gets too long. If someone is talking or typing too much, respectfully ask them to stop. If they continue, you may have to mute or kick them, and if they continue after that, a ban might be in order. When on Teamspeak, a certain amount of "visiting" is fine, but the gamers who want to communicate tactical information to others playing shouldn't have to constantly interrupt talk about the latest CPU, or talk of what's going on at school. If someone is talking too much and you don't feel like you want to address it, PM a clan leader and we can handle the situation. Team Switching - In some games this is a big no-no and if you are admin for one of those games, ask the player to go back, if they don't and you have the ability, move them back manually. If you continue to have problems, kick/ban them. In other games, like Bad Company 2, team switching usually isn't as big a deal. Sometimes friends or clan members might want to play together, in that case, try to facilitate them and swap some people around. This will show you to be respectful of community and they will probably be very appreciative of your efforts. If there is a mass exodus of people from a bad team to a good team, you can mention in-game that people need to stop. If someone is ignoring you and continues to unbalance the teams, just kick them off the server. For a game like Half-Life 2, teams change after each round, so trying to put clan members together is just a waste of time, that is why team switching is considered bad. Hacking/Cheating - This is the most overused excuse for kicking someone off of a server. Players are unjustly booted off servers all the time simply because they were too good. That is not fair. Do not base a decision on cheating on a single round, if it isn't really ridiculous score-wise, sometimes people just have great rounds. But if they continue to have an unbelievable K/D ratio, then you might need to ban them. Sometimes it might be necessary to ban someone just because they are killing the server. For me, this is the thing I hate to do the most. That person might be doing nothing wrong, other than being really good at a game. Try to put yourself in their shoes and only ban guys who are really obvious. I don't want to see anyone being banned for an aimbot because they went 29-0. I and many others have had a better score than that, it DOES happen. You have to consider how the person is playing the game. Are they playing as recon? Are they in the heli with a really good pilot? Sometimes, if you are unsure, it might be best to ask the opinion of a clan leader. Remember, visitors to our servers have the ability and a forum to complain about unjust behavior from our server admins. If someone complains about you, you want to know that you did everything by the book. Soldier Names/Nicknames - We will not allow names that are offensive to anyone. I think we can all use our best judgement here, but if you are unsure, ask another admin what they think of the name and come to a consensus before taking action. Players using racist names should be perm banned immediately. It does no good talking to someone like that because they're only goal is to cause trouble. Banter and Trash Talking - Now its okay to joke around, but if several players are going at it constantly on the mic or in chat just nicely ask them to stop. If it continues warn them again that if they don't stop they will be kicked, if for no other reason that mic/text spamming. If they ignore this warning then go ahead and kick them. A certain amount of this is fine as long as it's good natured, however sometimes this can lead to hard feelings so you have to use your best judgement of when something is going too far or things are starting to get out of hand. Racist/intolerant behavior - This is a subject that we will show no mercy on. If someone is being a racist, and that means they are hating on blacks, whites, browns, yellows, whatever the case may be, they get perm banned. No warnings, no kicks, just ban them. We don't need that kind of intolerant behavior on our servers. I don't care if the person is joking, I don't care what his real intent was, if he's spewing hate speech, he's gone. This also applies to someone who is spewing hate speech against a group of people, like Muslims, Christians, agnostics, atheists whoever. We are a gaming clan. This is our hobby and it's supposed to be fun. Everyone who comes to a TKC server should be respected and able to play the game hassle free. Not everyone believes the same, and if someone can't get over it and comes to our server with an agenda that includes racist or intolerant speech, I expect you guys to bring the hammer down swiftly. Metabans - We will use Metabans only for cheaters and will verify each ban using Cheat-O-Meter. This will ensure that we are not forcing our Metabans followers into banning players we have banned for breaking rules other than cheating. If we deem you are cheating and Cheat-O-Meter doesn't really indicate cheating and we can not find information about you or your clan tag, meaning there is no website or previous information on you as a player or clan that we can cross reference, we will ban you on our servers, but not Metabans. Clans must have a website that we can find and access to be considered legit, otherwise we will view your tags as hogwash and your suspect behavior will be deemed as cheating. Again, we will not add a ban that is not supported by Cheat-O-Meter to Metabans. We want everyone to have the best time possible so do your best to maintain a good gaming atmosphere, then everyone can have a good time. To join TKC you only have to read our "Code of Conduct" and then apply for membership by filling out an online application. After submitting your application you will become a "member candidate". You will be allowed to wear our tags but only as (tkc), all letters in lowercase. As you progress, as seen by our members, you will be advanced to (Tkc), then (TKc) and then finally (TKC). You will receive emails at each step with detailed instructions on what you need to do. To obtain your full membership and the right to wear the (TKC) tags, you will have to pass a vote by the TKC members. Only those members who have gotten to know you will vote. An 80% yes vote will be required for full admission. Please keep in mind that full membership takes 8 weeks. For you to be accepted you will need to display good manners, sportsmanship, and the ability to follow our rules. This applies to all game server activitiy and forum participation. If you do not feel you can meet our requirements we respectfully ask that you not apply as we have many who want to join and we can not waste time on gamers who are not serious about membership. So now you're a member of TKC congrats! It is important for you to note that membership in TKC is not a lifetime privilege. Only the clan founders Big Flem and Squidward have lifetime membership and can not be removed. Clan leaders expect it's members to participate in clan activites when they can, and to be an ACTIVE member in the clan. We consider active members to be members who regularly post on the forums, participate in clan activities when possible, and communicates and develops friendships inside the clan. We do NOT consider a member to be active if they only ever play on our servers and nothing more. The leaders of this clan work hard to organize events and if you can't support these activities, can't check and post on the forums at least once or twice a week, then you are not TKC material and eventually you will be kicked from the clan. If you do not think you can meet these requirements as a member of TKC, then please don't attempt to gain entry into the clan as you will only waste your time, and ours. In the past TKC had too many admins on our servers and things got a little out of hand. We are not looking for any new admins, however if we feel you will make a good addition to that team we will ask you. Being a server admin is not fun and games. It requires you to WORK, and follow server administrator rules which are well defined once you become an admin. Our admins are forced to stop playing whatever game they might be playing, and work to secure and maintain server tranquility reguarly. If you are an admin that does not mean you will get to run willy nilly and ban, kick, and torture at will. Admins who do not follow our rules will be stripped of admin duties and power. In addition there are more requirements of admins such as, reguarly checking our server admins forum. Once you become an admin you will be given access to this forum and you must check and read it quite often. It is a way for admins to help one another by posting their thoughts on what is going on, who to watch closely, etc. Do not ask us constantly to be an admin, that is the surest way I know to never become an admin. Our leaders will identify the best candidates for admin duties if we think it necessary. No. In order to have an official TKC server it must meet certain standards. In addition, we might not want a server for a particular game, and if you aren't an admin, then you shouldn't have admin authority on any server. Official TKC servers have to be setup as close to identical as possible. This means that the clan leaders must have all access to any of it's servers including the ability to restart that server, gain access via FTP and game panel. It means that the clan leaders can setup the server with it's normal settings and add the usual addons. In short, if you want to have your own server then that is fine, but don't try to name it "Boom Boom Room" or tie it in any way to TKC. Clan TKC maintains several servers that are open to it's clan members and the public. In addition TKC has other expenses that require money. To pay the bills TKC relies on it's members and visitors to donate. Without these donations, TKC will cease to exist. Please consider donating money when you can. We do our best to use the money wisely, to invest in TKC, to invest in PC gaming. If you're using Firefox and the bar graph looks like a thumbnail image, turn auto resizing off (or use IE to view this page). Here is how to do it: go here.